Mine was spent behind the wheel. Took my 5-year old to Grandma's in Cullman on Saturday, then made an about face on Sunday. 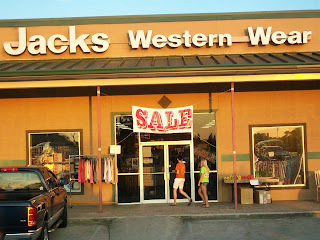 First stop, truck stop. Meet the family business. 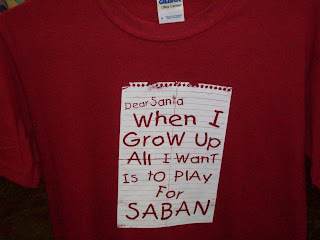 A cursory check yielded no such Christmas requests to play for Gene Chizik at Auburn. Not yet anyway. 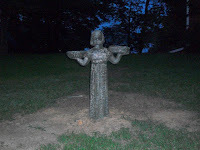 When I spent the night at my father-in-law's lakeside estate (more on this in a later post), I found a familiar looking statue waiting for me. And much like the Savannah version, she guards headstones - in his front yard. 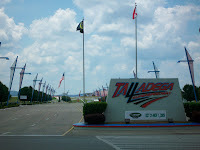 Swung by Talladega Super Speedway on the way back. If fictional race car driver Ricky Bobby ever enjoyed any Talladega Nights, that would be a fictional account too. If there's any nightlife in this sleepy town, it would be a major upset. Despite being almost constantly on the road, my XM radio kept me connected with my Yankees. Heard both weekend games in their entirety. Got to watch Federer make quick work and history on Sunday morning. Got home in time to see a vintage Tiger Woods Sunday finish. I Like New York in June, How About You? Meet Your 2009 American League MVP?